I always hesitate to use the word sleeper because readers often associate that word with "no-name players." I prefer the word "undervalued." As a drafter, this is what I am always looking for: value. If I can get a 3rd round value in the 6th round, it gives me a significant relative advantage over my opponent. The following players (e.g. Donald Butler) most people have heard about and really aren't considered "sleepers." However, this doesn't mean they can't provide just as much relative value as a no-name player that comes out of nowhere. In this article, I recommend four players at each of the 3 defensive positions (DL, LB, DB) who I believe will be significantly undervalued heading into the 2012 fantasy season. This list will be continually updated throughout the off-season. RDE Cameron Wake (MIA) - Wake is a new addition to the defensive lineman club as he will be moving from outside linebacker to defensive end in Miami's new 4-3 scheme. I expect his production to be pretty similar to that of previous years making him a solid DL2. LDE Kamerion Wimbley (TEN) - Like the aforementioned Cameron Wake, Wimbley will be transitioning from outside rush linebacker to defensive end in his new home of Tennessee. His seven sacks last year were a bit fluky as 4 of them came in one game against the Chargers. Even with this said, he's still typically good for 6-9 sacks a year and he will be playing on an underrated defensive line. He's a sneaky option for those willing to get a little risky with their DL2 spot. LDE Robert Quinn (STL) - Quinn is a top level talent and produced at a relatively good rate in his rookie season (5 sacks). He's one of the more boom/bust picks on this list as his value honestly could fall anywhere from DL1-/DL4+. At his current ADP however, he's worth the risk. LDE Carlos Dunlap (CIN) - Dunlap's 4.5 sack total is a bit misleading, as he also had 13 QB hits and 29 QB pressures to finish as a top five 4-3 defensive end in Pro Football Focus' ratings. From a fantasy perspective, many people drafted Dunlap late in drafts expecting a breakout year that never came and therefore he will likely slip in a lot of drafts. With this said, there is great value here with Dunlap assuming the Bengals give him enough playing time. DL1-/DL2+ potential if all the chips fall into place. He falls a bit in the rankings due to a knee injury suffered in preseason which will likely keep him sidelined for the first regular game of the season. MLB Colin McCarthy (TEN) – McCarthy turned out to be one of the best mid-season waiver wire IDP pickups of 2011. In just 8 starts, he racked up 50 solo tackles, 13 assists, 2 FFs, 2 FRs, and 1 sack. If you extrapolate those numbers over the course of an entire season, McCarthy is a solid LB1. I expect his numbers to improve further this season as he will only get better with more experience. RILB Donald Butler (SD) – Butler graded out last season as one of the top run-stopping linebackers in the game which is a pretty impressive feat for a 2nd year player. Judging by the Chargers 1st preseason game, Butler will move into an every down role this year. If this is indeed the case, he has 90-95+ solo tackle upside. 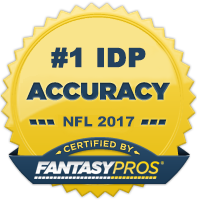 This is a guy you definitely want to buy low on as he is likely to emerge as one of the top IDP sleepers of the 2012 season. WILB D.J. Smith (GB) – With Desmond Bishop likely out for the season, 6th round pick D.J. Smith will slide into the WILB position for the Packers. Smith filled in for Bishop last year for a handful of games and produced solid low-end LB2 numbers. Expect Smith to build upon those performances this season and finish within the top 30ish. SILB Perry Riley (WAS) – It may have taken awhile, but Riley finally overtook Rocky McIntosh as the starter alongside London Fletcher last season. Riley saw his first starting action during week 10 and never relinquished that role. During those 8 weeks, Riley averaged 8.5 total tackles per game (roughly have of those were assists). He definitely has a limited ceiling as long as LFB is in town, but owners should feel good about grabbing him as a LB4 with LB3+ upside. RCB Alterraun Verner (TEN) - Verner had a very productive rookie season in 2010 with 85 solo tackles and 3 INTs. The return of Jason McCourty pushed him back into a sub-package only role however in 2011, which put a serious dent in his production and made him unrosterable. Verner will be taking over the duties of the recently departed Cortland Finnegan this season and is a very nice sleeper candidate late in drafts. I wouldn't be surprised to see 75-80+ solos and 3-4 INTs. SS Kurt Coleman (PHI) - Coleman will head into the season as the starter at strong safety over Jaiquawn Jarrett. He had a couple monster games last season at the position and is worth a roster spot as a high upside DB3 as long as he's the starter. Considering his historical coverage problems however, it may not be long until he finds himself on the bench. FS Kerry Rhodes (ARI) - Rhodes had a fantastic 2010 fantasy season and consequently was one of the top DBs drafted in most of last year's drafts. However, an early season injury kept him off the field for the majority of the year and thus he's likely to fall back down in drafts this season. Take advantage of this value.